Chevron Raises Alarm Against East Bay "Anarchism"
Eduardo, the dangerous Martinez, is a retired public school teacher and registered Democrat. He’s silver-haired, soft spoken, neatly dressed, and rather distinguished looking. For years, he has devoted himself to good causes in Richmond, including serving on the city planning commission. On that body, he has been an influential voice for Richmond’s Environmental Justice Coalition. Chevron did not forget that Martinez—Eduardo, not Al—helped to challenge and change its original blueprint for “modernization,” a project that will employ 1,000 building trades workers. And that’s why Richmond voters have just discovered, via expensive mass mailers and phone calls, that Eduardo Martinez is really a wolf in sheep’s clothing. This mailer again displayed a glowering, angry-looking headshot of Martinez—one of three appearing in the first piece (which made him look a little bit like the late Leon Trotsky, who was no anarchist). 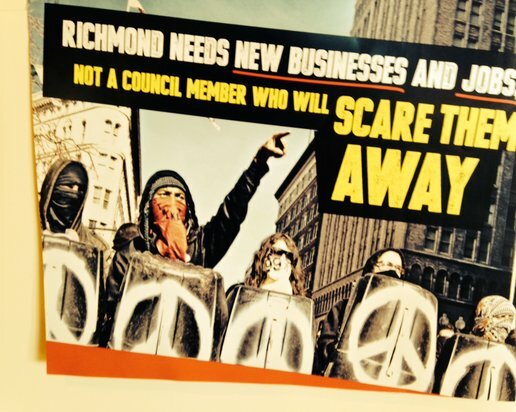 The second brochure noted that “Richmond needs new businesses and jobs” but, with a card-carrying “anarchist” on its council, the city won’t be able to attract either. The bottom line: “Eduardo Martinez is too radical for Richmond.” For more details, readers are directed to a Moving Forward website– www.NoEduardo.com—where we learn that Martinez is “so radical that he does not think the city council should exist”—a truly unusual stance for any city council candidate anywhere. Just as these dire warnings landed in the mailbox, my home phone started ringing. It was Research America, a Sacramento-based pollster, calling to discuss local politics. Who was paying for this opinion survey, I asked. Oh we can’t disclose that, my would-be interviewer said, but you can talk to my supervisor. Her supervisor didn’t know or wouldn’t say who was behind the call either, disclosing only that Research America had been retained by EMC Research, a firm based in Oakland, who was acting on behalf of some third party whose identity could not be revealed in order to “maintain as much impartiality as possible” in the polling. Stop right there, I said. How could that be? McLaughlin has twice been elected mayor of Richmond, and once before that to the city council. Martinez only narrowly lost his previous council race two years ago. How “out of touch” could they be with a won/loss record of 3 to 1 between them? Besides, I said, “I belong to the RPA and I’m a Richmond voter. Does that mean I’m ‘out of touch’ with myself? My good-natured interlocutor at Research America plodded through the rest of her dreary task—which consisted of reading and asking my reaction to a long series of questions or statements, almost all of which deliberately misrepresented the political views, personal behavior, or public record of Martinez, Mayor McLaughlin, and Richmond Vice-Mayor Jovanka Beckles, a third RPA-backed council candidate. The Occupy-related scuffles in downtown Oakland in 2011, which Martinez had no connection with, were duly revisited. Anyone who didn’t know the RPA candidates personally—or hadn’t bothered to follow Richmond issues very closely—would have been left with a distinctly unfavorable impression of Martinez, McLaughlin, and Beckles. Eager to confirm the identify of those displaying such “impartiality” while conducting a public opinion survey, I called and/or emailed Research America in Sacramento, EMC Research in Oakland, Chevron in Richmond, Moving Forward in San Rafael, and the firm of Whitehurst/Mosher, a key Chevron advisor, in San Francisco. Whitehurst/Mosher is listed as a paid “campaign consultant” on the California Fair Political Practices Commission Form 460, filed on July 30, which shows Chevron ponying up $1.6 million, all by itself, for the Moving Forward “coalition.” Neither Research America or EMC are listed yet as “payees” for any services rendered. These calls were necessary because, as Evans correctly noted, there is no mandated disclosure of who is financing phone polling, no matter how propagandistic. Corporations or unions bankrolling “independent expenditure” committees–like Chevron’s Moving Forward—have to put their names on the direct mail brochures they send out to sway the electorate (and, in California, report their funding sources to the FPPC.) But their hired “public opinion” surveyors are free to engage in “push polling,” with complete funder anonymity, until the next round of FPPC form-filing months later. Instead, a non-Latino who received half the votes that Martinez got—but who doesn’t belong to the RPA —was appointed to the council for the next two years. This led Eduardo to run for city council again this year, as part of the three-person slate which includes RPA leader Gayle McLaughlin, a registered California Green, who is termed out, as mayor, after eight years in that office. At the meeting of West County Democrats, Martinez tried to convince his fellow party members that his personal refusal to accept corporate donations made him a good candidate for local Democrats to endorse. Both he and Beckles, who was also seeking the club’s backing, pointed out that Chevron’s massive display of unfettered (and, in some forms, hidden) political spending illustrated the post-Citizens United threat to reform candidates throughout the country, regardless of party label. Their plea fell on partially deaf ears. Neither RPA candidate got the 2/3 vote necessary for the group’s endorsement. On Sunday, Martinez was raising funds the old-fashioned way, one-on-one, at a house party attended by Richmond residents. The donations were modest, but there was a silent auction to boost the take. In 2012 race, Martinez raised about $35,000–$20,000 coming from individual donors and $15,000 in local public matching funds. He expects to raise and spend a similar amount in the course of this year’s run for office. It’s easy to do the electoral math. Eduardo’s total spending will be in the range of $1 per voter, if turnout is similar to last time. Meanwhile, Moving Forward will be spending more than $50 per voter, for its four preferred Richmond candidates, and possibly much more. Already, Chevron’s “independent expenditures” on behalf of the other Martinez have given him instant visibility via billboards, direct mail, other advertising, and, soon, paid canvassing as well. None of this activity has, of course, been “authorized” by or coordinated with any of its lucky beneficiaries—and certainly not the “push polling” that depicts a local progressive Democrat as an “anarchist,” of the violent and irresponsible sort. But it sure makes running for municipal office a lot easier if your name is Al rather than Eduardo Martinez. If the latter suffers a second defeat on Nov. 4, he won’t be the only loser in Richmond.